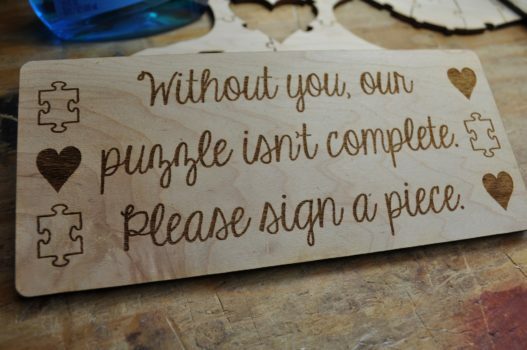 Enter the name, word or saying you want in the center of the puzzle and we’ll take it from there. Add what you want on the border in the next section. 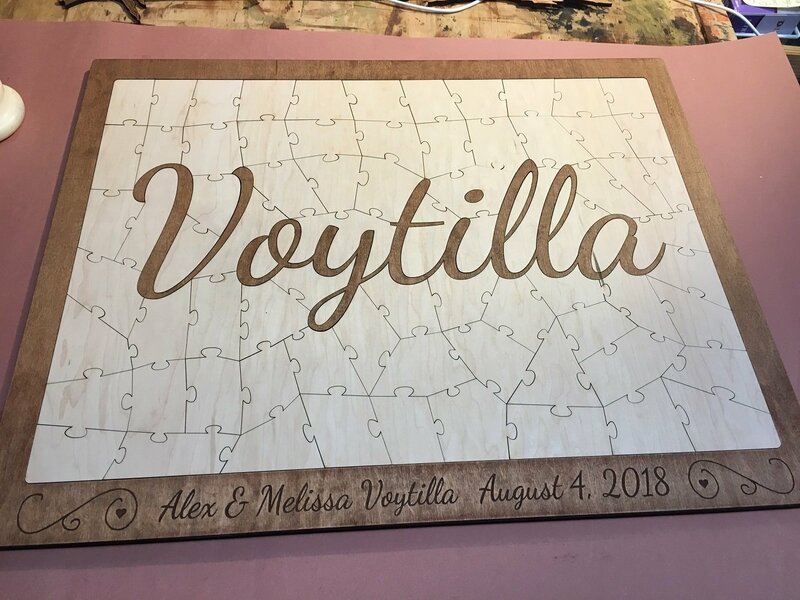 These name puzzle guest books are 100% unique to you! 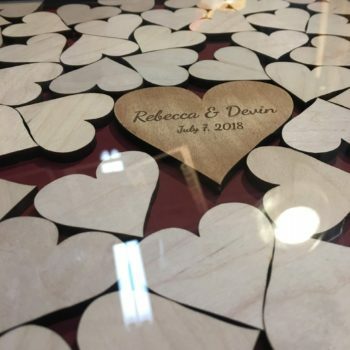 Great for weddings, and also great for other events such as family reunions, birthdays, baby showers and other events to commemorate a special day in style. 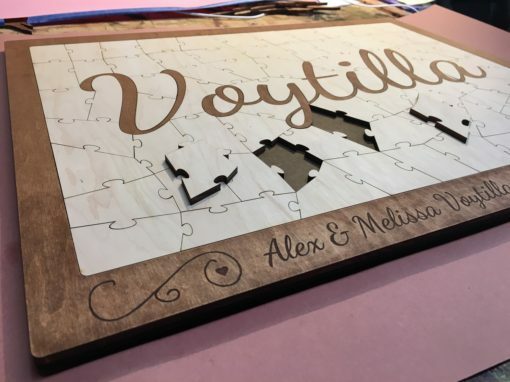 The attendees always enjoy signing the wooden puzzle pieces, and you’ll enjoy reminiscing & challenging yourself with putting the puzzle back together down the road. 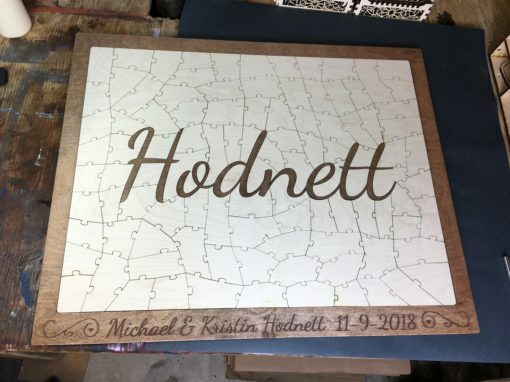 Name puzzles are all completely custom and made to order – they are designed and built to order based on the number of pieces you prefer, and no two puzzles are the same. We spend a lot of time making sure all the pieces fit nicely with your name and the final product is something you can cherish for a long time to come. 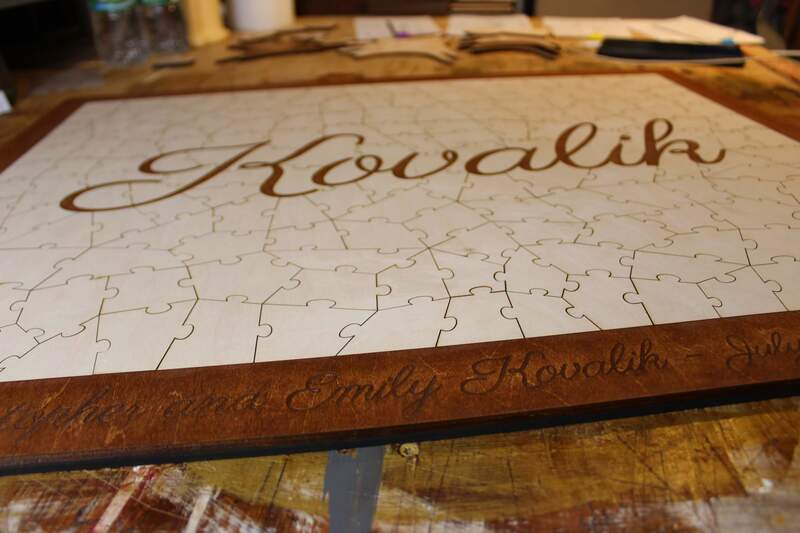 The puzzles are large with good sized pieces. Certainly more than just a name or two can be written on them. 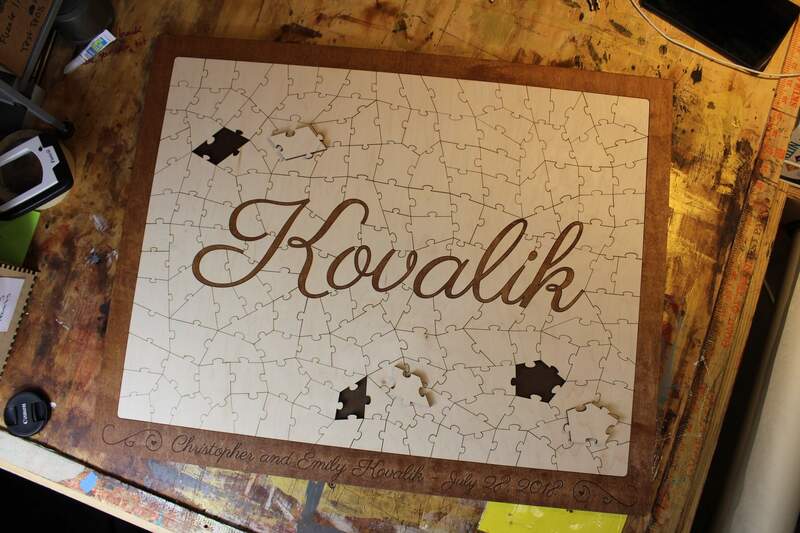 The puzzle includes a border and it can easily be hung on the wall. You can secure the pieces in place with glue dots, spray adhesive, or tacky putty to keep them from falling out of the frame once hanging on the wall. To adhere them permanently within the frame, use super glue, wood glue or a clear coat finish. 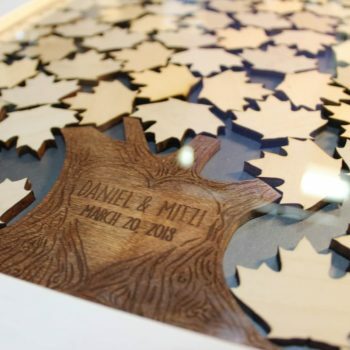 We suggest including a symbol to separate the name and date if you’re not including “Est.” Typically, people choose to use a heart, but this can be any symbol or icon, such as a shamrock. Font. The default font for these letter puzzles is called “Dancing Script,” and this will be used for the large letter as well as the engraved text on the border unless you specify otherwise. You can see an example of all the capital letters in Dancing Script in one of the images. If you decide on choosing a different font, it must be free to download. You can include a link to where it is downloaded in the order notes section which you’ll find during checkout. 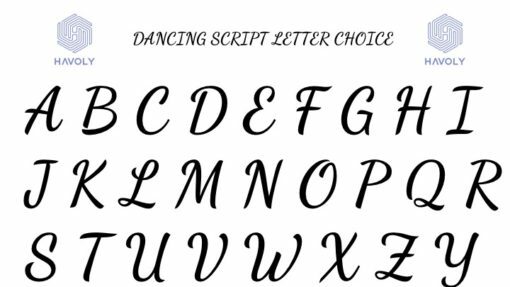 A selection of free fonts can be found at fonts.google.com and dafont.com. 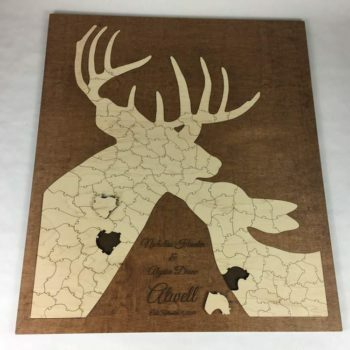 Have an idea for a new puzzle shape? Drop us a message! We always trying to create new and exciting stuff. You should also join the mailing list and stay up to date with the new creations as well as get exclusive deals. 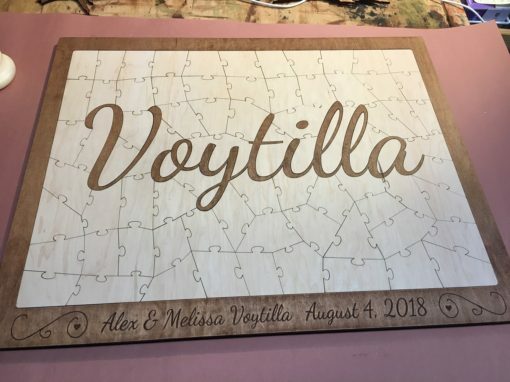 I’m so excited for my guests to see the puzzle and add their well wishes! 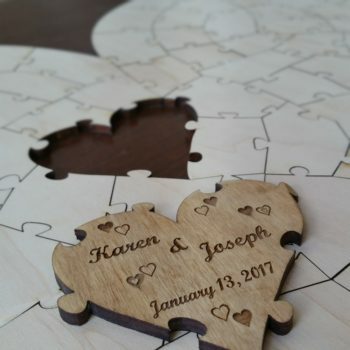 Will definitely share on Facebook after the wedding!